Yesterday I spent the day at Stage 18 of the Tour de France. One of the advantages of this particular stage is it’s a time trial. This means that each rider races individually, with the first rider of the day starting around 10:45AM, and the last rider of the day finishing around 5PM. 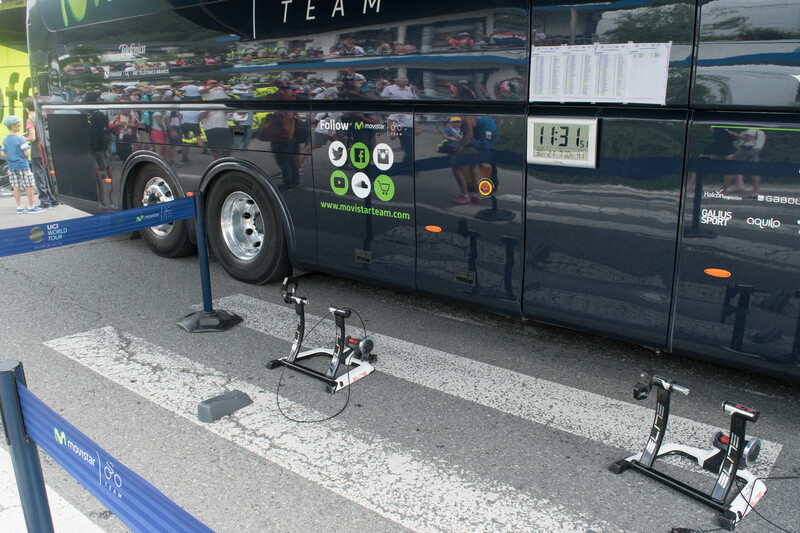 This means that at the starting area the teams are visible at the buses and busy/active virtually all day long. 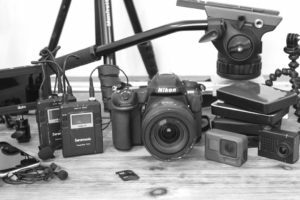 Which in turn means there’s tech (and new tech) available to photograph all day long. 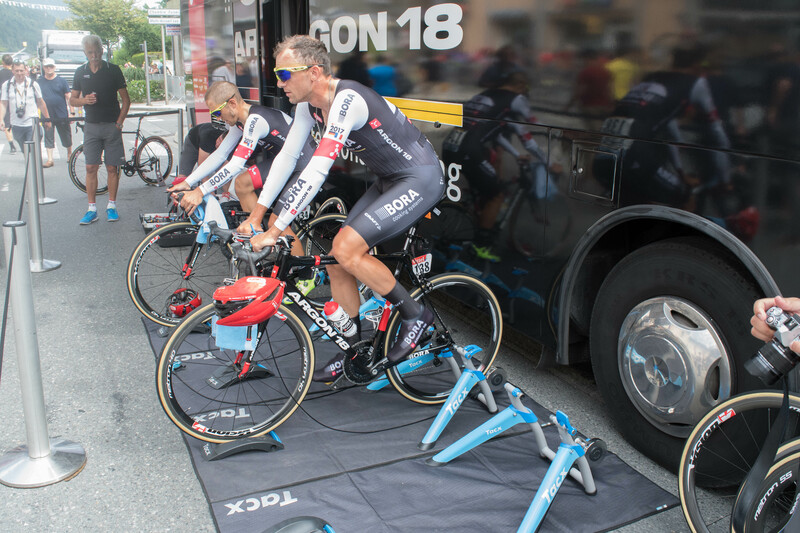 Further, since all riders will warm-up for varying time lengths on the trainers, they’re actually out and visible. 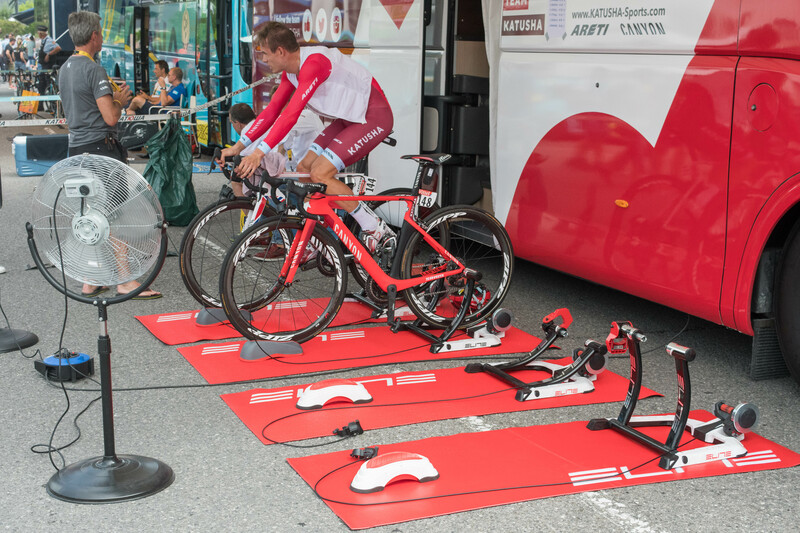 One rider’s warm-up had him doing about 40 minutes or so on a trainer prior to the start. 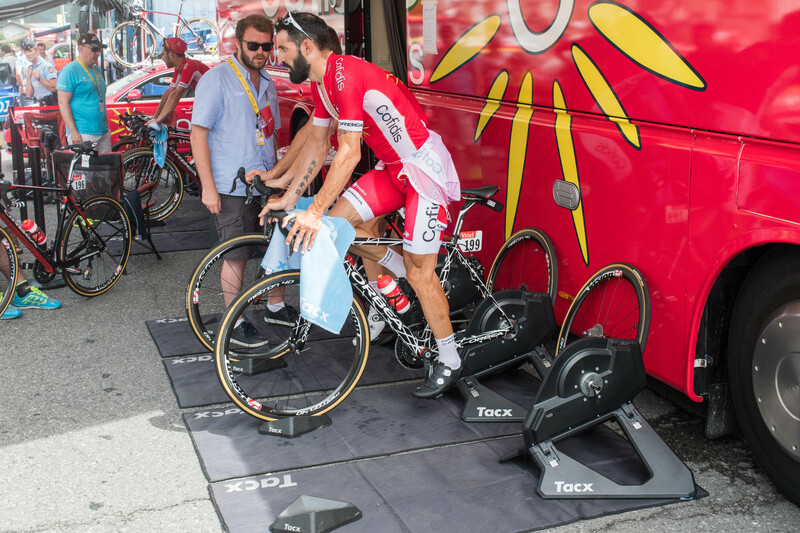 Whereas a regular stage may see no riders warming up on trainers, thus, they aren’t brought out for every stage. 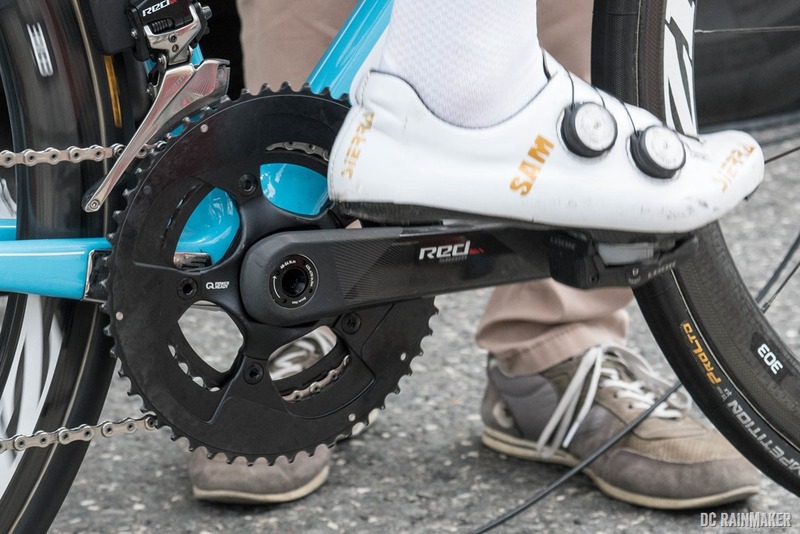 Meanwhile, in the power meter (PM) world you’ll often get teams trying out new tech in the later days of the Tour, and that includes new power meters or updated prototypes of previously known power meters. There was more than one team riding prototype units out there. Before we move on, remember one thing with pro teams and gear: They’re all sponsored. Companies pay for sponsorship of a team, and/or provide gear for free in exchange for visibility. It’s the way the industry works. 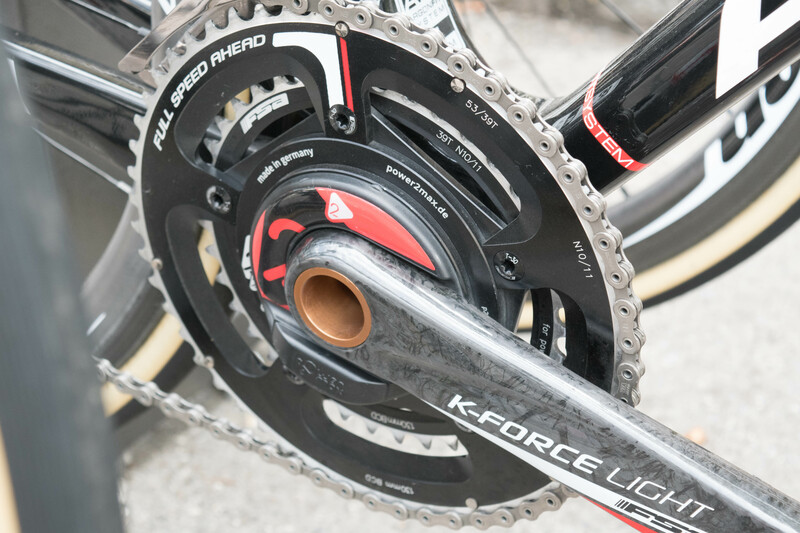 For trainer and PM tech, it’s more commodity than other bike parts, and thus to a large degree the highest bidder will win. Oh, and lastly, there are two specific new things not seen before or published anywhere else that I managed to find. 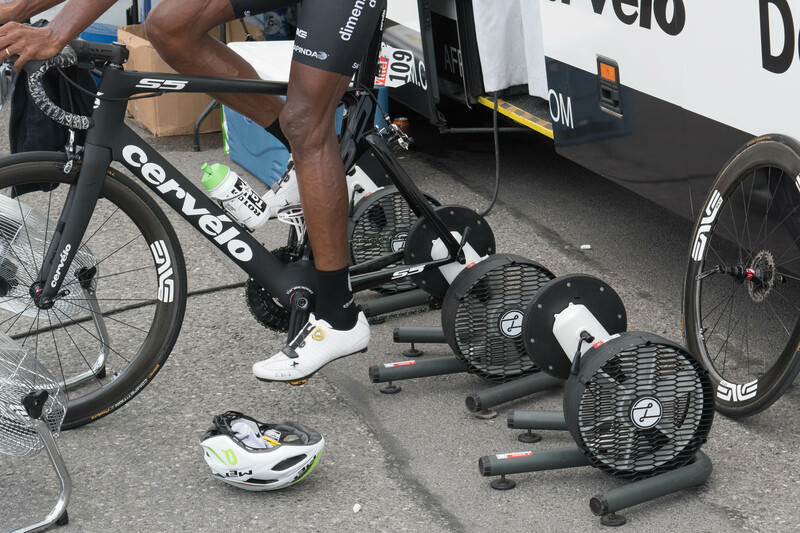 One each in the trainer and power meter section. 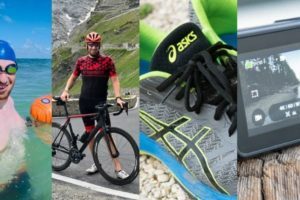 When it comes to trainers, they’re virtually always team-wide sponsorship’s. 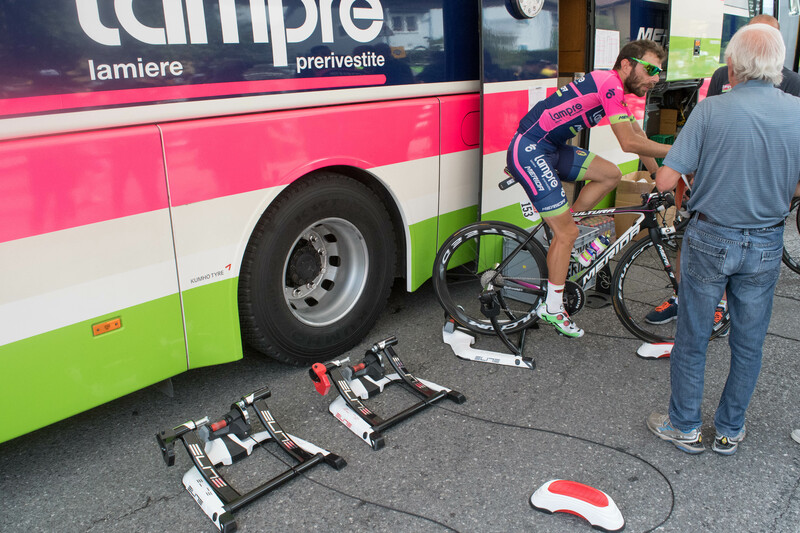 This means that the whole team is all using the same brand of trainer, albeit sometimes differing models. 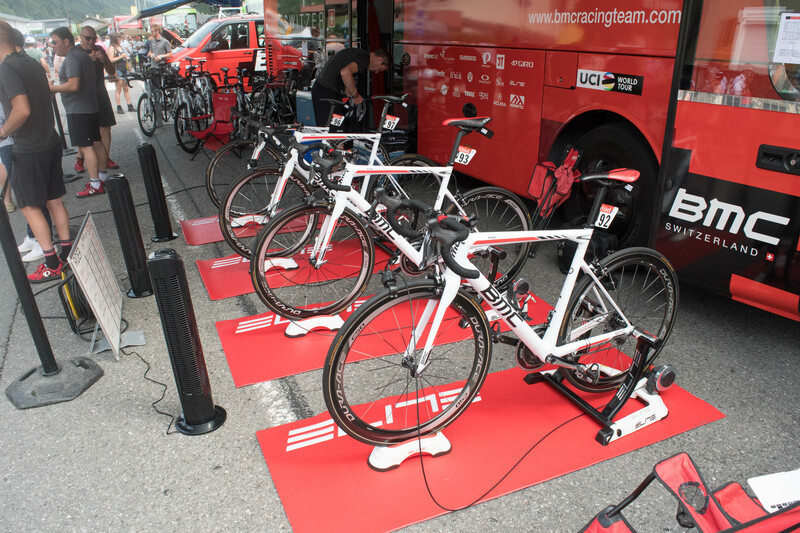 In many cases teams will choose trainer models that work without power for use on the Tour, which may skew them away from higher end computerized models – as many high-end models require being plugged in. 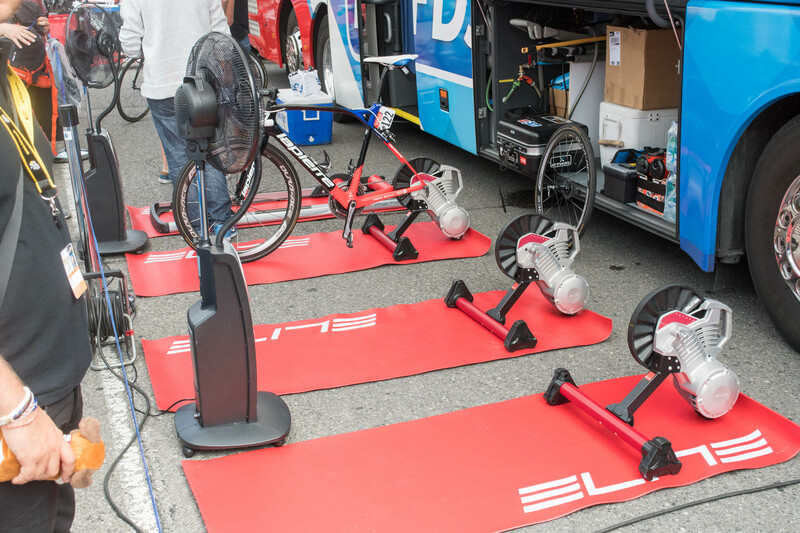 Sure, team buses can provide such power (and they do in some cases), but it’s just one more thing that a team has to deal with on race morning. 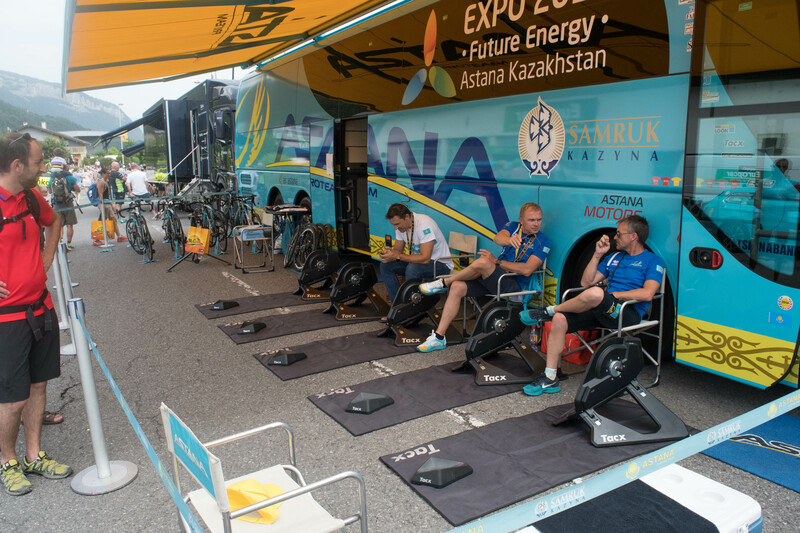 As such, the vast majority of the Elite sponsored teams are likely using additional other higher-end connected trainers when not in a race situation. But for the purpose of today’s listing, I’m just focused on what was there and present on race day. Next, here’s a gallery of trainer goodness, with a pic from each team. You can hover over them to get the picture label specifying each team name. 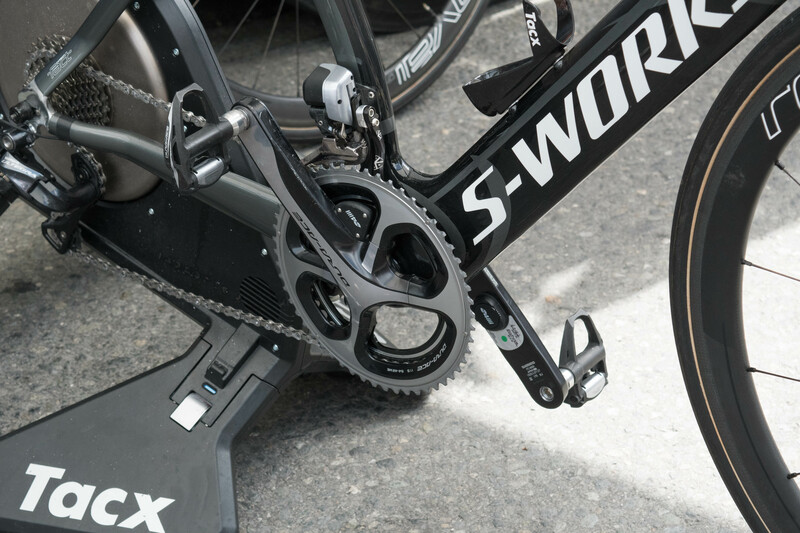 It’s interesting to see that Tacx basically has everyone on the NEO’s across the board, minus two team’s with some Satori Smart units around. 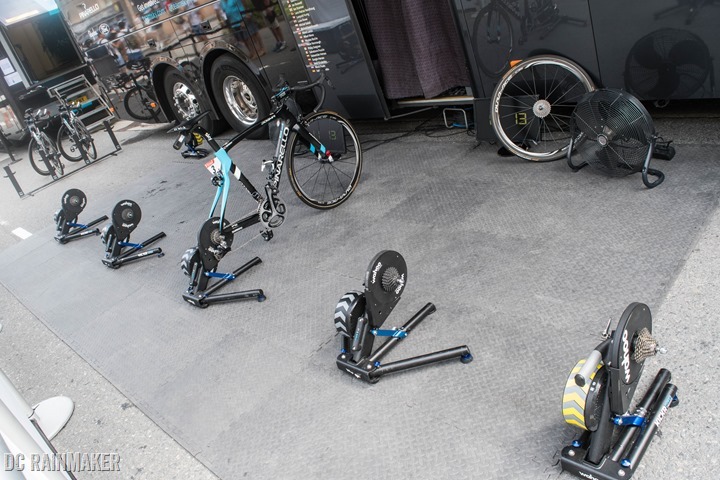 Likely they just wanted some quick and light trainers to have available without taking a wheel off. Similarly, on the Elite – virtually every team is using the same model, albeit a much lower end model (but it does transmit ANT+/Bluetooth Smart). Again, in a warm-up scenario they don’t need a lot of complexity, so this works quite well. Here’s a bit closer look at it. Of course, Wahoo is keeping mum on the topic (despite Team Sky tweeting it out) and broadcast TV showing Froome warming up on it. The unit was there for a good solid 6-8 hours yesterday, however I didn’t get to hear it in operation during the time I was there. However rumor is it was quieter than a regular KICKR when Froome was on it, but given it’s outside where sound is easily absorbed, one has to take that with a grain of salt. It still has a belt with grooves, so there will definitely be some noise there (though many have suggested ways of cutting down that noise significantly through different belts). 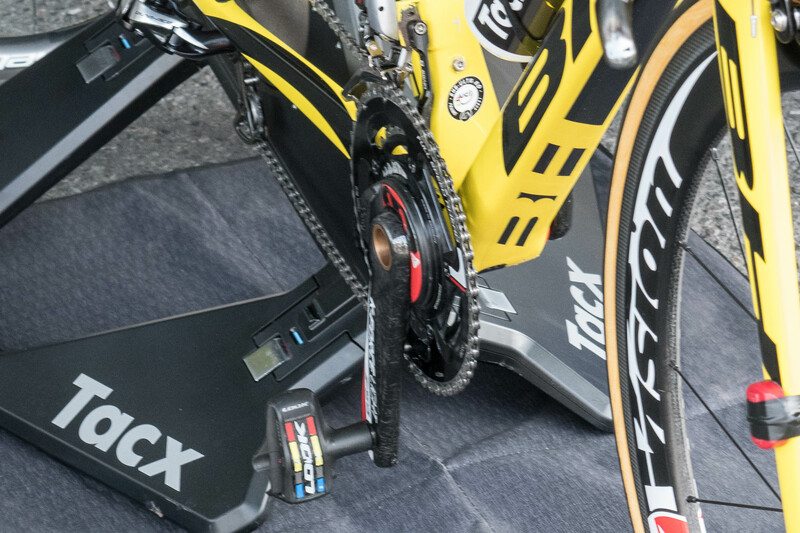 Also of note is that while the team bus had two yellow-themed units, the other unit I saw was definitely just an old KICKR with a new flywheel sticker. 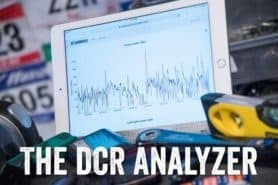 In any case, I’m sure as we near Eurobike we’ll hear more, though it certainly falls in line with rumors out there of a new KICKR for the upcoming season. Plus, I get the feeling Wahoo was looking to stir things up a bit here, else they certainly wouldn’t have had Froome ride it, knowing TV cameras would be covering him during the warm-up. Now remember, like trainers, I would place almost no value on why one team chooses a given tech over another team. 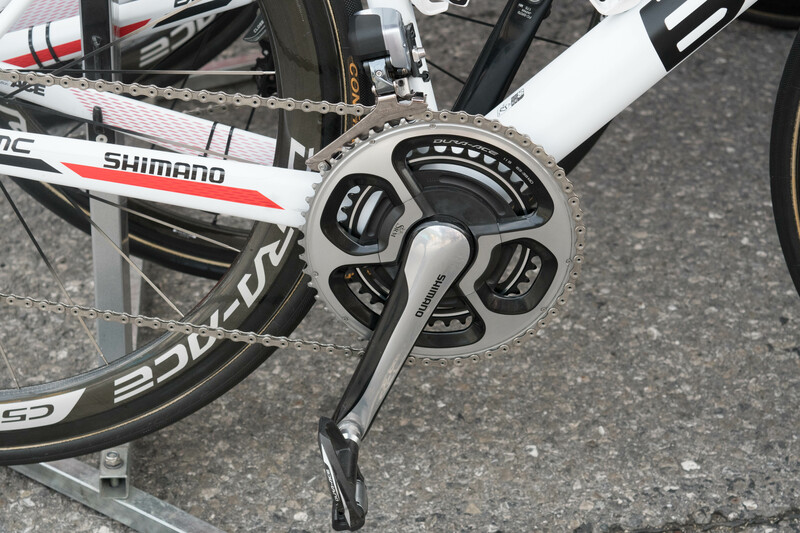 Sure in marketing spin a team will say that they get something magical from one power meter over another, but in reality, that magic is called money. We see teams switch between PM’s as soon as a better offer comes along – even when that offer is sub-par in capabilities. Also, you’ll see many cases where teams will be running units for the whole season that aren’t yet available to consumers. 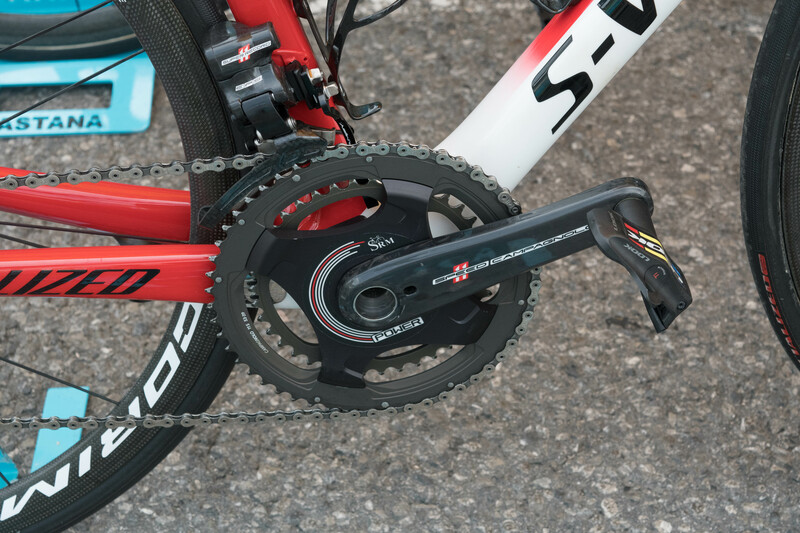 That’s in particular the case with 4iiii and Stages (left only power meters), where the teams (Team Sky and Etixx–Quick-Step) are in some cases using dual versions that aren’t shipping (or even offered in Stages case) to consumers. 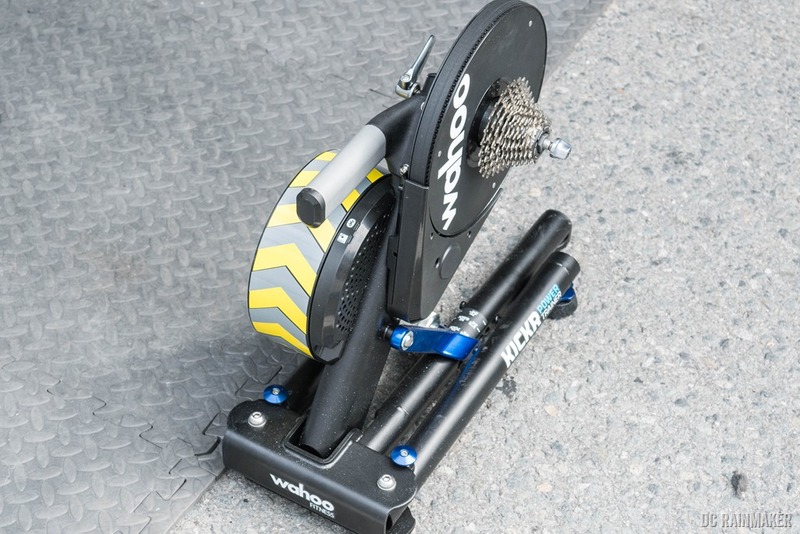 Plus of course the Quarq prototype example below. 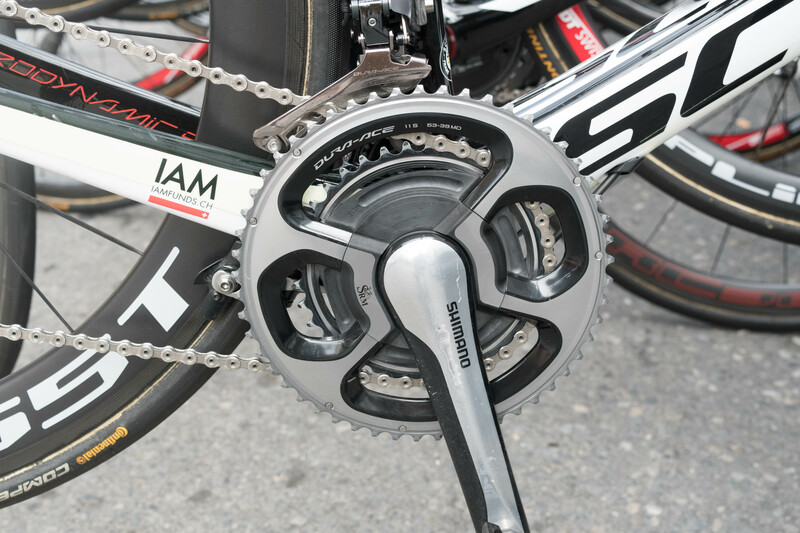 Then there’s some cases teams have an official sponsor for a given power meter, but aren’t actually using it. 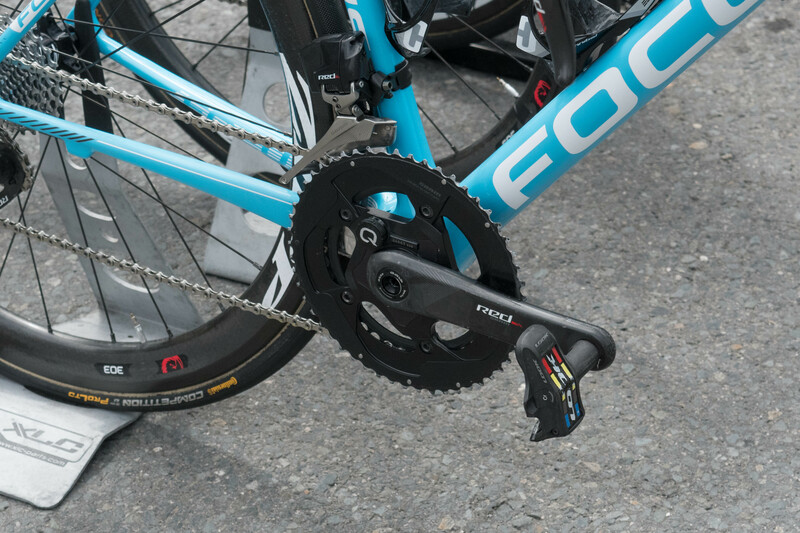 That’s the case with Look for example, where Fortuneo-Vital Concept isn’t actually using the Look KEO power meter in the Tour, but just using the pedals. 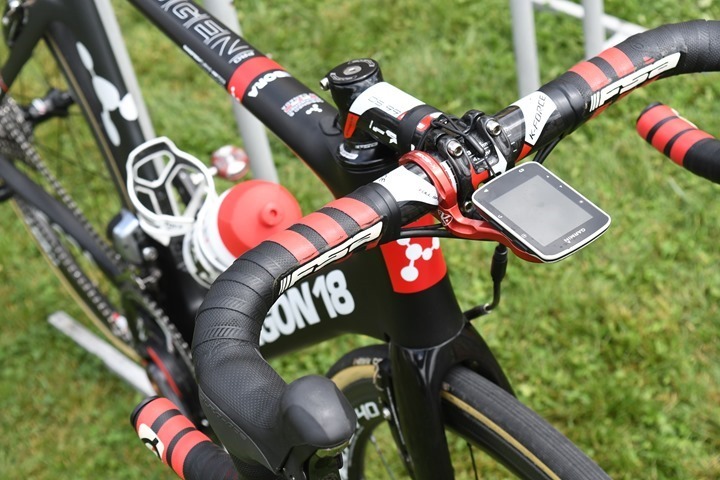 You’ll remember this being very similar to Garmin Vector pedals a few years back, with only a portion of the team actually using it. 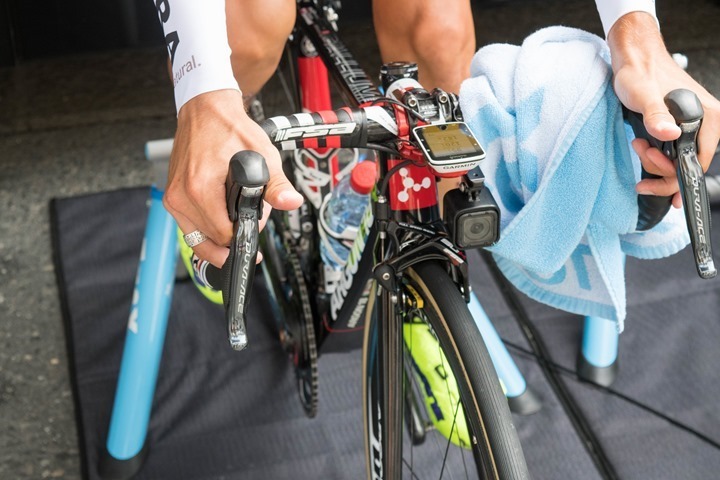 In the case of Garmin, that was due to it being more complex for team mechanics. I suspect the same may be true with Look, given the pod-like nature of their unit that’s structurally similar to Garmin. With that – here’s the run-down of where teams stand. 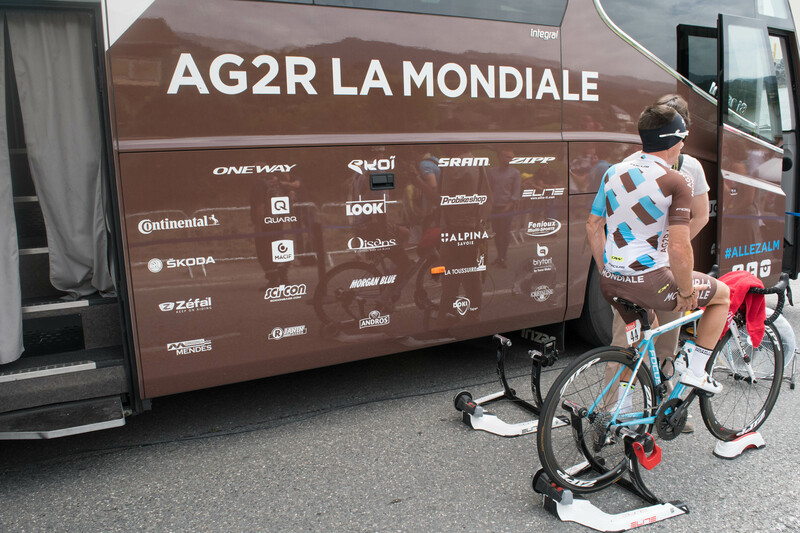 Quarq (SRAM): Yesterday I found a single rider from AG2R that was using a prototype Quarq power meter. 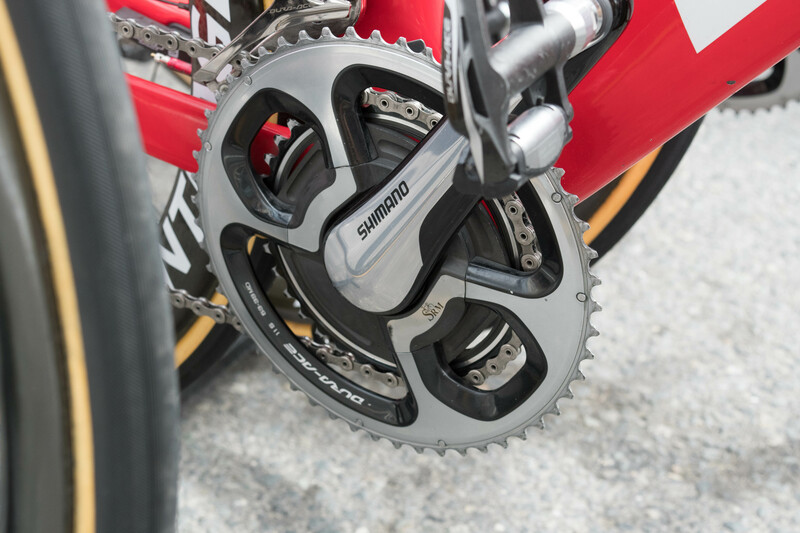 This unit was mounted to a SRAM RED crank arm, however lacked any of the obvious spider backed components typically found on a Quarq power meter. Since the rider had just started his warm-up I was unable to find a different vantage point before I had to run elsewhere. 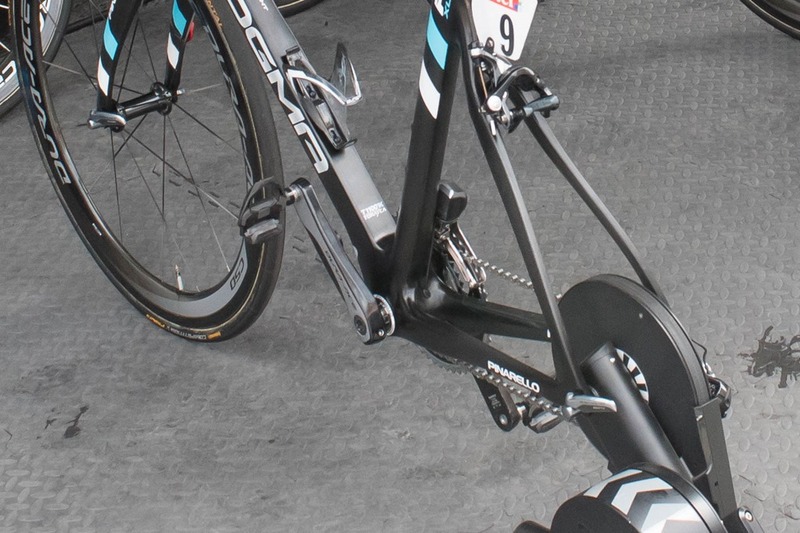 My guess would either be a bottom-bracket style power meter, or something built straight into the crank arms themselves. I suppose it’s possible they’ve reduced the chainring attachment size so much to make it totally invisible from the side I was on, but that seems unlikely since other competitors are still quite visible from further away. 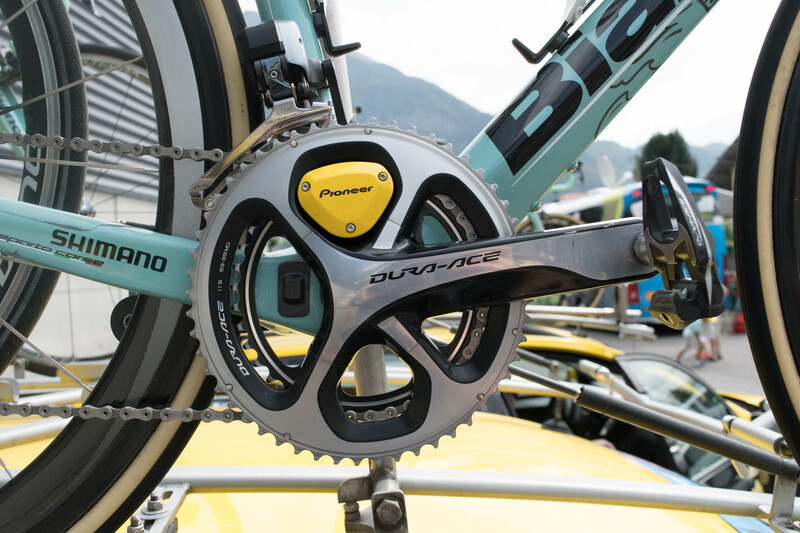 Further, it’s also possible it could be no power meter at all, and just a logo shell of nothing, but given every other bike in the collection had power on it, it’s highly unlikely a single bike would have no power yet still have a Quarq logo (especially on a time-trial stage where power is most critical). 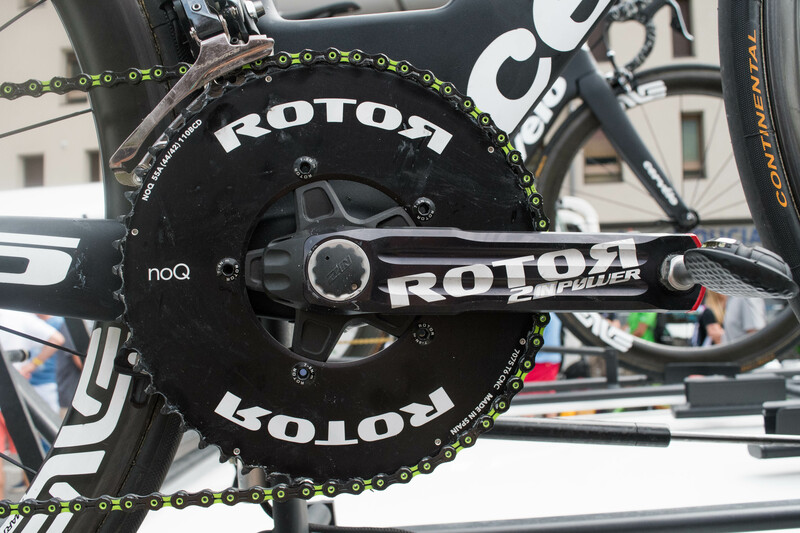 You’ll see they’ve added a Quarq ‘Power Ready’ logo (using the Quarq Symbol), which hasn’t been used anywhere else to my knowledge. 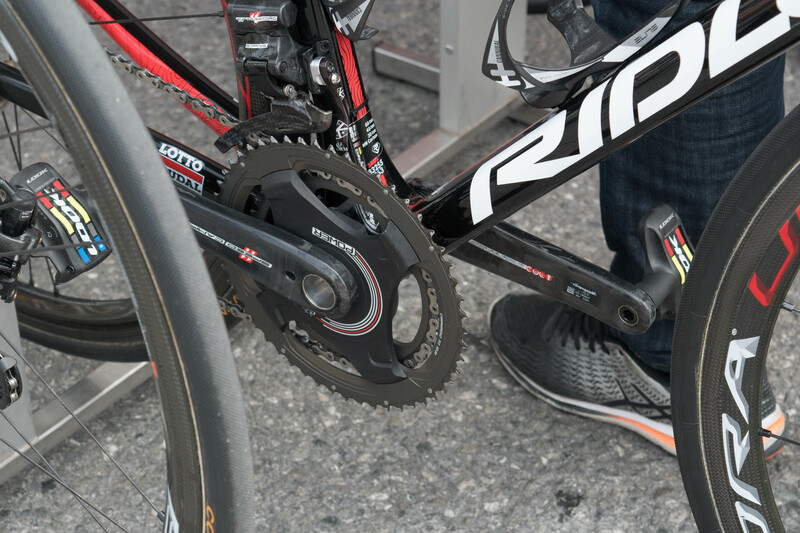 Note that only the one rider from the team was using it yesterday, all other riders were using standard Quarq SRAM RED units. 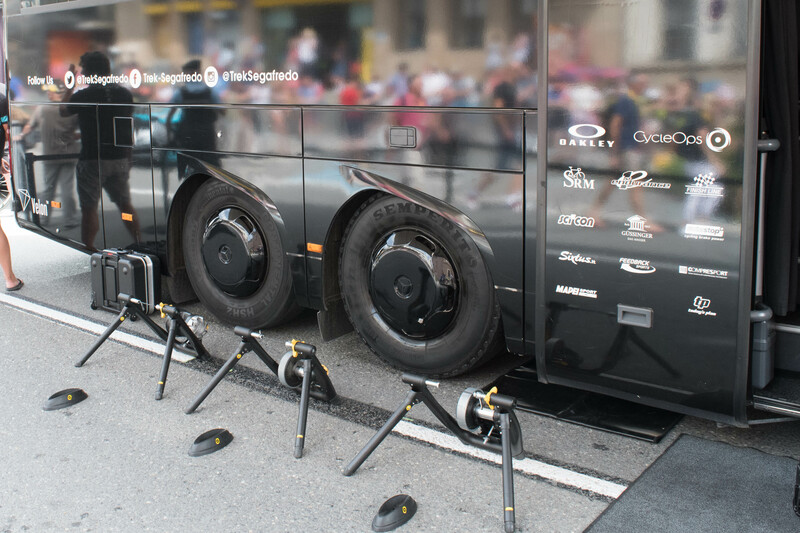 Stages: Team Sky is running a blend of both single-leg Stages (standard production offering), as well as dual-leg editions (not currently offered to consumers). The dual-leg one hasn’t really changed much since the various prototypes we’ve seen over the past two years. 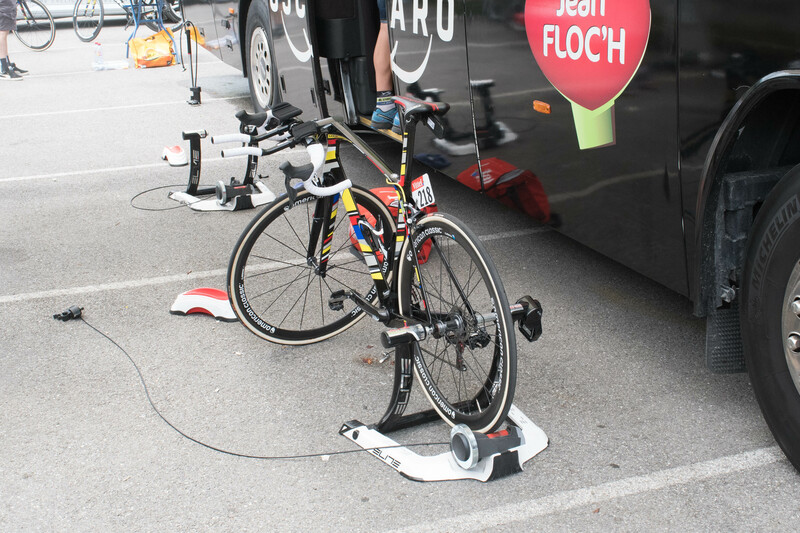 You’ll remember some additional (and much better) pics I took of it back at Paris-Roubaix in my tech section. 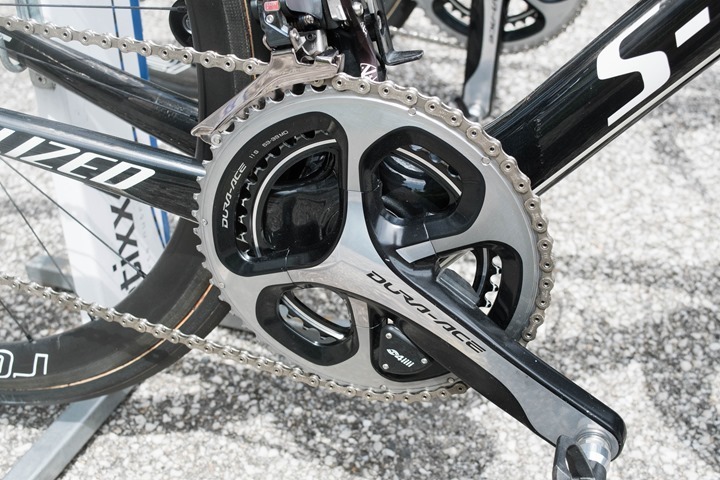 4iiii: Etixx-Quick-Step is running a blend of both single-leg 4iiii Precision units (standard production offering), as well as dual-leg editions (not currently offered to consumers). Their dual-leg version that as previously shown off at Sea Otter, was announced today as being available (shipping) starting next week. 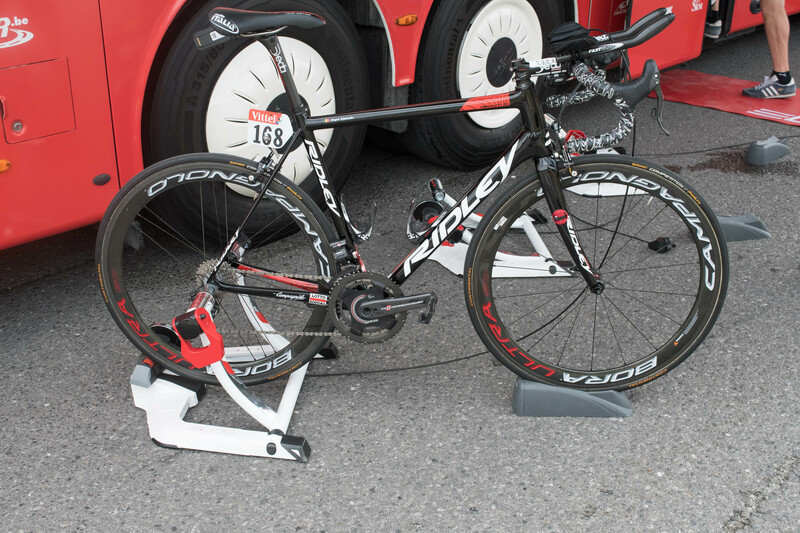 Power2Max: On one of Bora-Argon 18’s bikes there was a single unattributed Power2Max model. This model looks similar to the Type S, except that the battery/electronics pod is now placed perpendicular to the crank arm, versus with all other Type S units it’s aligned to it. Phew! Lots of details to consider! But definitely to me the two biggies were whatever Quarq and Wahoo have up their sleeves. I’ll round-up the more casual ‘enjoying the stage’ aspect in tomorrow’s post. And then of course we have Sunday’s final stage in Paris, which I’ll definitely be out and about at as well! 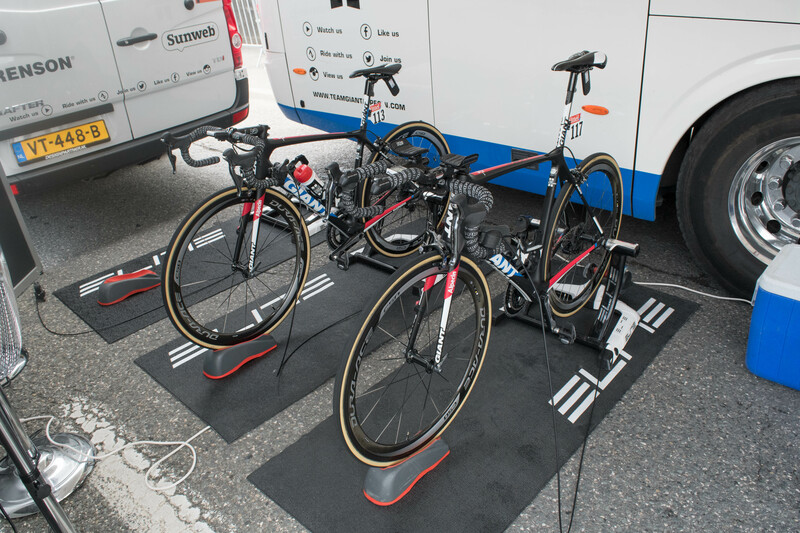 « Zwift & Tacx launch ability to shake your trainer riding cobblestones. For real. 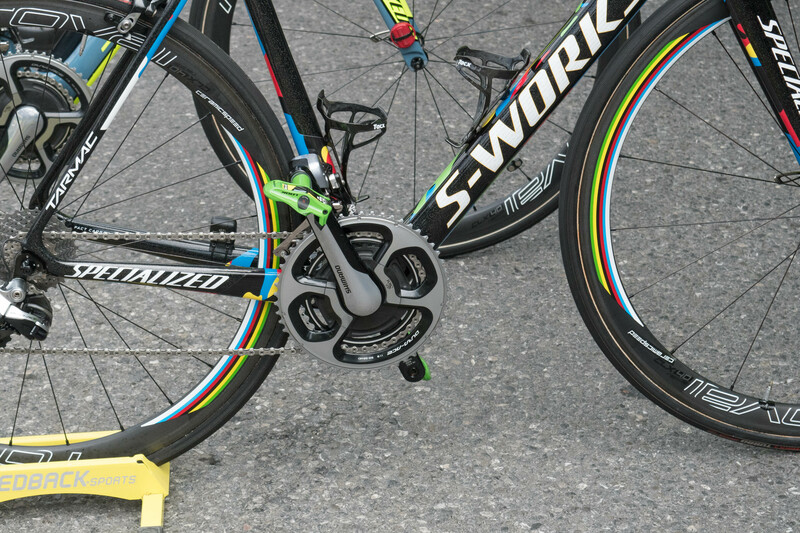 Wow, neither Vector or PowerTap.. 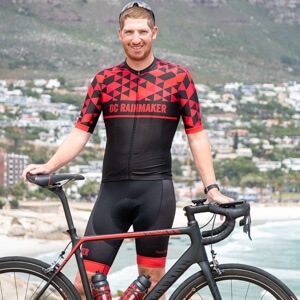 The powermeter market is so difficult. I don´t know which one I would buy. 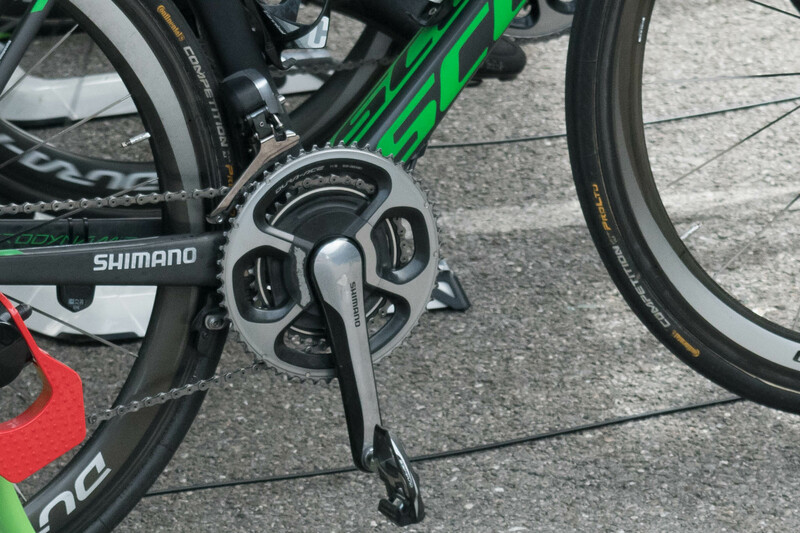 I can be mistaken but looking at the list of the power meters I didn’t see any power meters on pedals like Garmin or P1 . Do you know why? 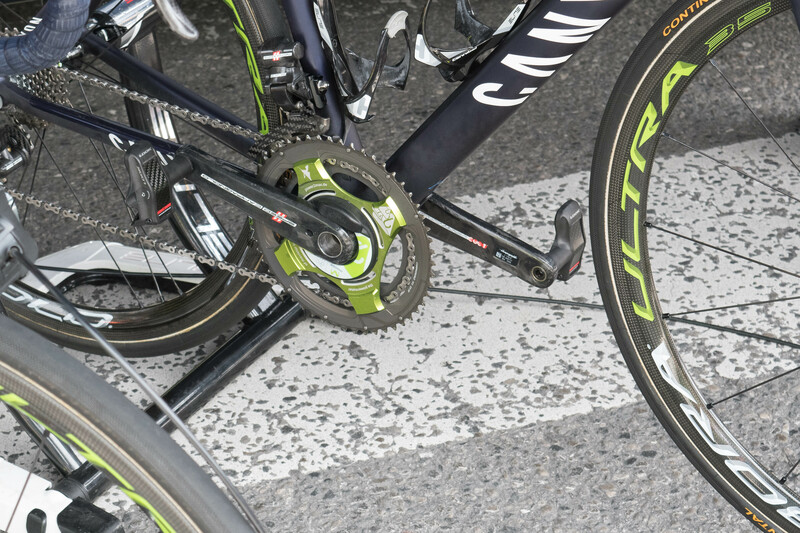 Garmin technically provides gear for a team (Cannondale), but they’ve said in the past that logistically Vector was too cumbersome to deal with in terms of day to day mechanical aspects. I’m sure pedal type preferences also came into play. 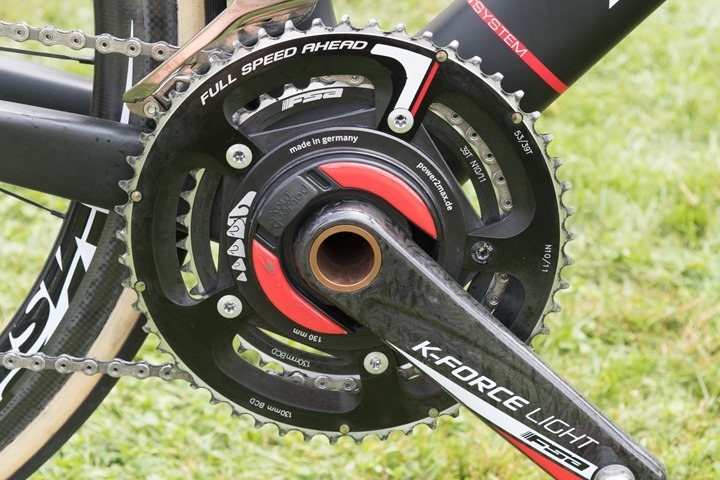 With PowerTap (and really any other brand), it’s really just a case of them not wanting to pay to play. Which is logical. 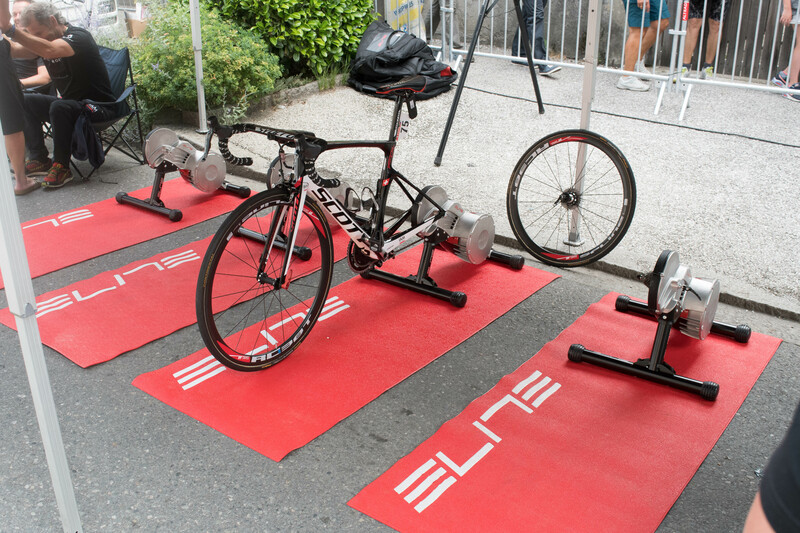 I don’t think it buys them anything to pay to sponsor a pro team for power meters. They’re already a well known name in that field, and they’re also priced well enough so that they aren’t trying to compete just on brand-name. 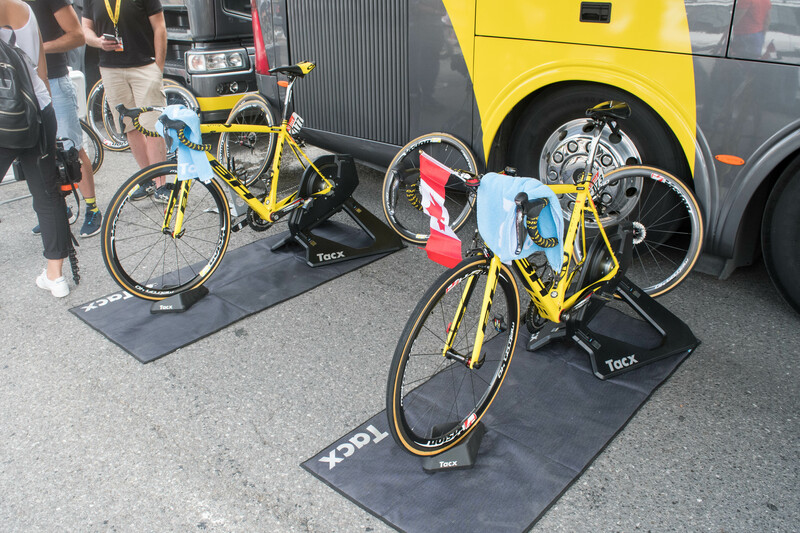 Maybe that KICKR is yellow because Froome is using it? But there were two yellow KICKR’s, one old…and one new. 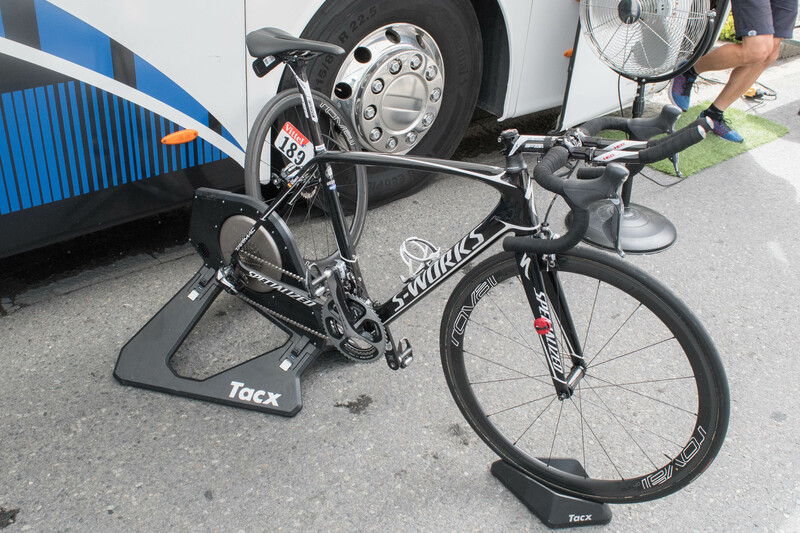 Though super odd to ride that in a time trial, given its the one stage where power is most valuable. I was thinking exactly the same, just a bare, but removable, spider. Hmm, I’m curious about the minor Power2Max redesign. Maybe it’s just to play better with BB386EVO BB shells? Ant+/BLE? Hmm. Yup, the micro-USB socket is interesting because it may mean (finally) end-user firmware upgrades. Also, I wouldn’t be surprised to see dual ANT+/BLE. Nothing earth shattering here, but power meter updates rarely are. 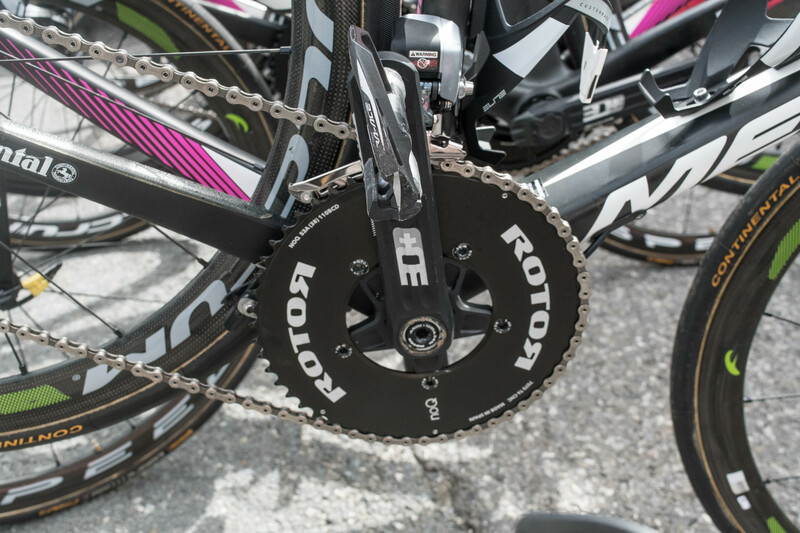 Considering SRM some time ago decided to cut hard on sponsorships, it still amazes me that so many teams still decide to go with them. Even having to pay out of their own pocket, SRMs come head and shoulders above in maintenance and overall cost while offering little to no advantage over so many other brands that would be happy to go with at least a gear-and-assistance-for-publicity-type scheme of sponsorship. You got any data on SRM return/repair rates or cost of ownership? At 50€ a pop for a battery change plus two weeks of turnaround time I need not know anything else. I rewatched after your tweet and thought there was something odd with froome’s kickr, but at the time couldn’t place it. I have a lot to learn about cycling. Running is so much simpler. …and to pay a lot more…. True although judging by the number of running shoes I have got and for different types of running not always so clear cut! Anyway perhaps it is the more than the man than the machine as remember when Froome jumped on Geraint Thomas bike with different shaped cranks and presumably bit different bike fit there did not seem to be any slowing of his speed. Instead of asking what you might have heard about the updated Kickr, which I’m sure you can’t reveal anyway, I’m curious what do you think should be updated on it, besides a nicer handle? Bigger flywheel? Simulated cobbles? 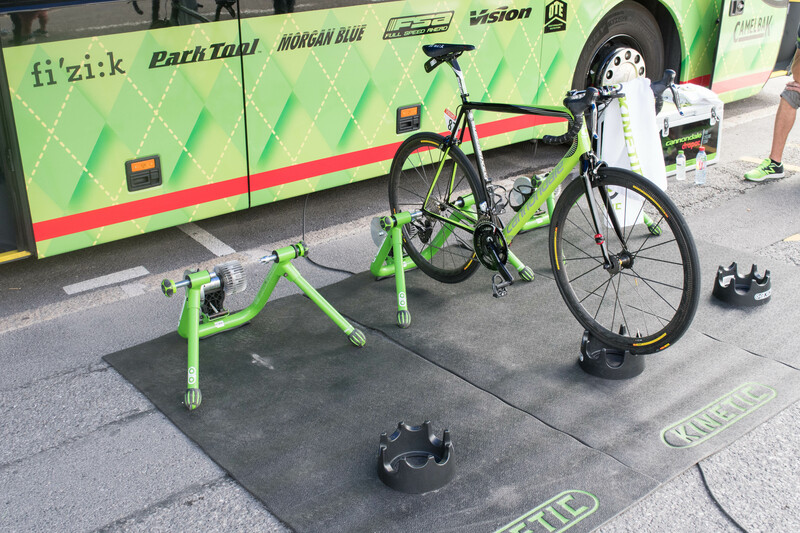 I’d love some lateral movement left to right so you could stand up properly on the trainer. That for me seems like a much better improvement than simulating road surface. A while back I saw somewhere that someone had actually mounted a CompuTrainer to a Rock and Roll trainer frame. It required some shop work, but kinda a neat idea for getting that lateral movement. That looks cool! I just hope they will offer some kind of upgrade kit for the existing Kinetic R&R users. Yup, there is. Though, the pricing seems a bit out of whack compared to just buying the whole thing new. Not a ton out of whack, but a tiny bit. Did you pay attention to what head units were in use? 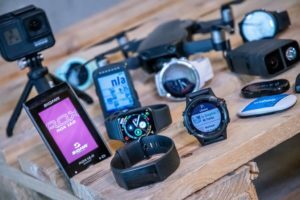 From what I see on TV it’s mostly Garmin, with SRM the next most popular. I don’t know off-hand if Team Sky is using ELEMNT’s this year (in the past they’ve used Garmin units with a custom external shell). Was it Direct Energie using Sigma? 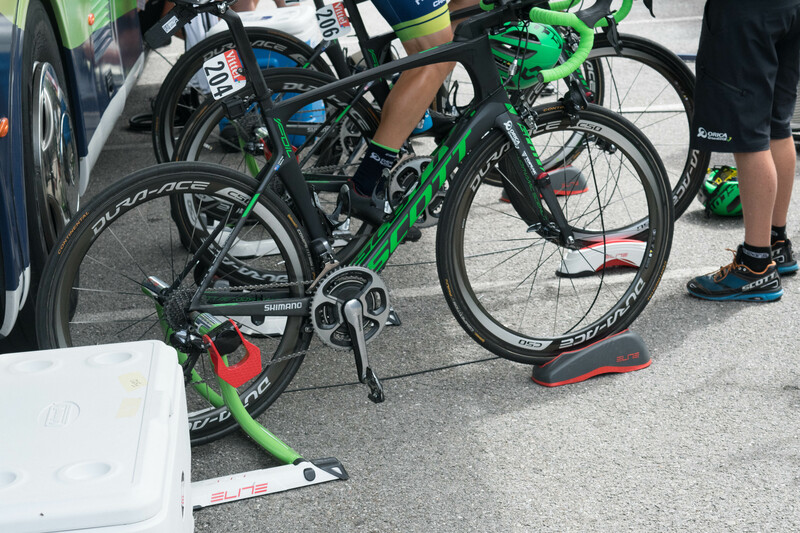 Pretty sure I saw Sigma on their bikes when they were Europcar last year. Hi! 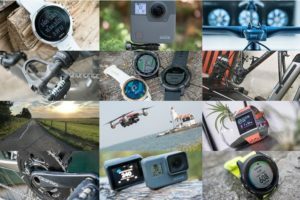 Do you know what mount is that on first picture (with gopro session)? Trying to find better options that self-made ugly one. It’s a K-Edge mount. 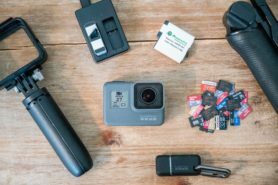 Rock solid mount that gives you the best footage. 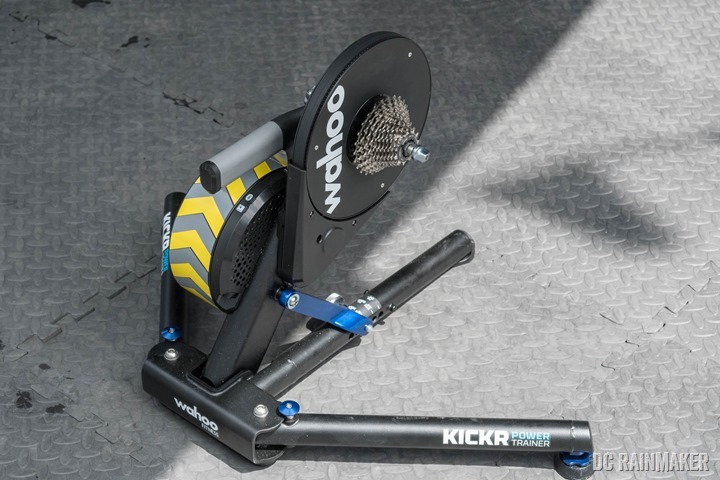 The Quark power could be a spindel based powermeter? Looks like the right axle stub on the new Wahoo Kickr is no longer threaded. 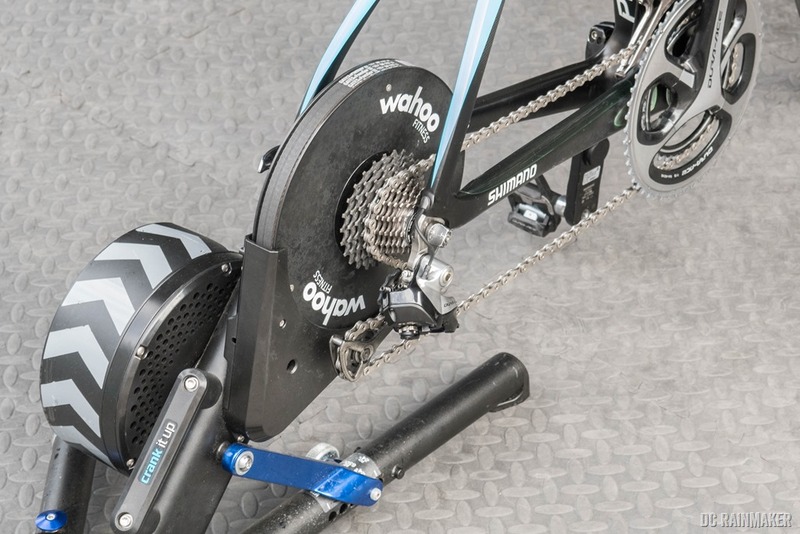 I believe this to be a friendlier interface for CF dropouts, particularly in trainer use. 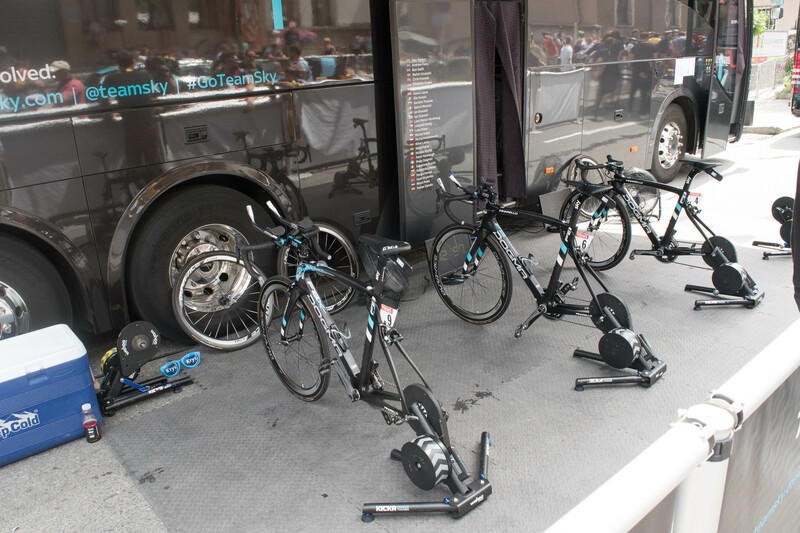 Interesting that Team Sky seem to have exclusive deals with Wahoo & Stages. Probably 3-4 weeks after a unit arrives to me. 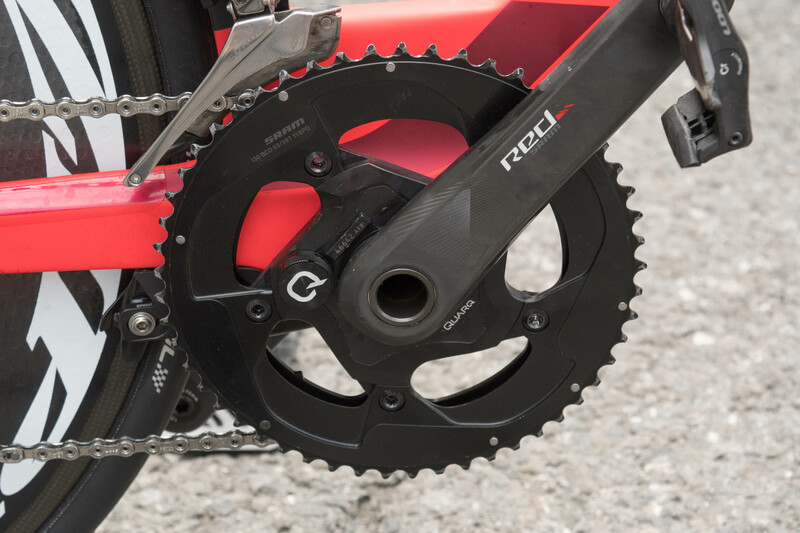 It seems that sram will finally have the red crankset ready to put a spider based powermeter, without the obligation of purchasing the powermeter with the cranks, I think that it is a good idea, the consumers like us will appreciate it. Keep with the grat work, thank you. 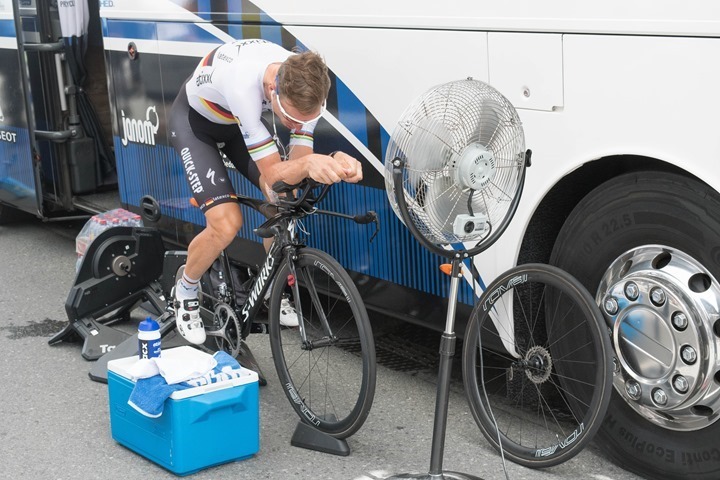 It’s a bit off-topic, but does anyone know the make and model of the fans (silver blades/black base) in pictures 3, 12, 17 (Etix and Katusha) of the trainer gallery ? 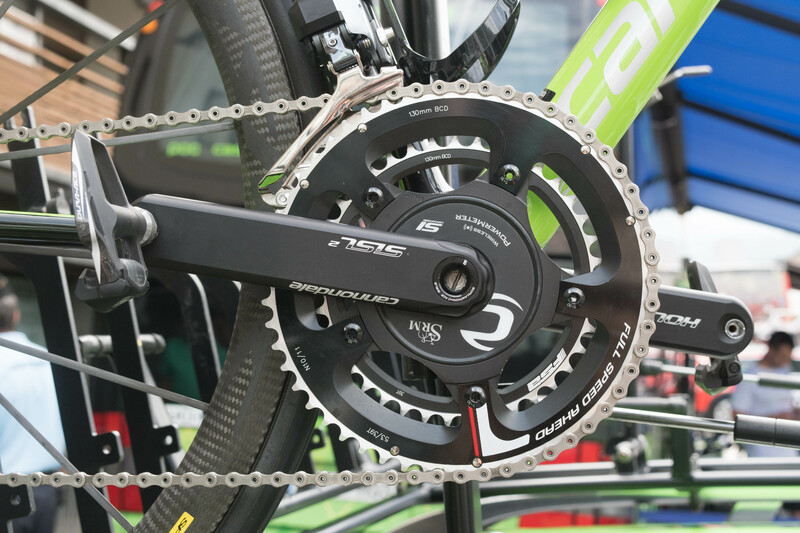 Quarq Prime are cranksets that are power meter ready. 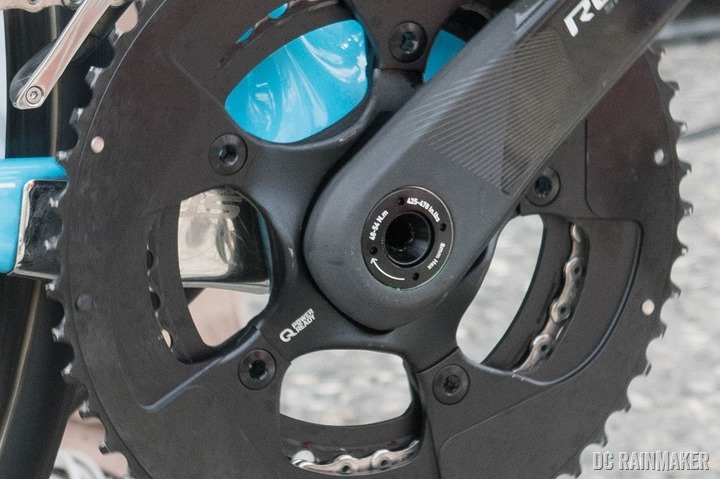 Mostly a marketing gimmick to get people to buy the new Quarq DZero which goes live at the end of the month. You spend $1079 on the spider to get power. 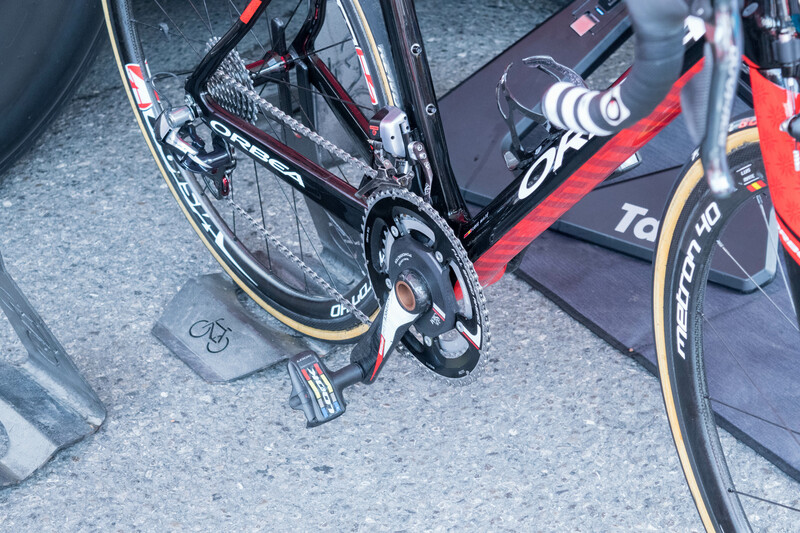 Similar to how Quarq supplies spiders for Sworks cranks. 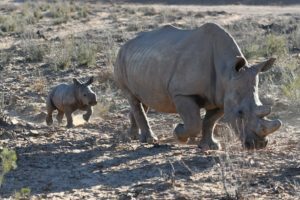 The DZero looks like a good product. It takes the top tier position above the Elsa R and adds Bluetooth along with the 10k temp compensation found on the Elsa RS.